It’s already April 2018, how? Time flies, that’s how. With it now being 4 months into the new year, I thought I would touch base on what all has been happening in the world of comics, the good, the bad, the rumors, and what should just be forgotten about. I also will discuss a few things that are coming soon in the world of comics. It seems like 2018 will be a big year in new changes for comics. People leaving, people switching sides, books ending, and new ones starting, it’s happening in 2018 and I’m here to talk about it. Alright, I know that Bruce proposed to Selina back in 2017 but the date of the actual wedding is getting closer and will happen in 2018. July 4th to be exact with issue #50. Yesterday, or April 4, 2018 if you are reading this on a day that’s not the 5th, was the release of issue #44 of Batman where the covers featured the wedding dress and the tux. Did you get your copy of one or both? Well, if not then you might want to get over to your shop or ebay. I don’t see this being a too difficult issue to get or too expensive, but it won’t be cover price either. Right now the cheapest on ebay is $6.49 for the Bruce cover and $8.90 for the Selina cover or $14.99 for both from one seller. 10 years of writing Spider-Man and with issue #801, Dan Slott will be leaving the book. In that decade of writing he has done a lot to the character, like killing Peter Parker, making Doc Ock Spider-Man, destroying the relationship between Spidey and Black Cat, he made him, “big time”, when he went to work at Horizon Labs and made the claim of no more people would die (that didn’t last long). He started the Spider-Verse, which introduced Spider-Gwen (not his creation but no Spider-Verse no Spider-Gwen). He made Peter Parker into a Tony Stark. By that I mean he made him rich and famous while giving him his own international company called Parker Industries. He brought back the clones and Ben Reilly, who turned out not to be so good anymore. He had Aunt May marry John Jonah Jameson, Sr., the father of J. Jonah Jameson, the guy that hates Spidey, which made Peter and Jameson step-brothers. Slott has done a lot to the character but after the years he is moving on to write Iron Man. The new team on the title will be Nick Spencer as writer, Ryan Ottley drawing, Cliff Rathburn as inker, and Laura martin on colors. Nick Spencer and Ryan Ottley are planning to take Peter Parker back to some of his roots but what will that be? Spidey has been around for 56 years where he has went from a teenager to an adult, from shy kid who had no friends and couldn’t talk to the girls no less get a date to being married to a super model and not only having a ton of friends but having friends who are powerful people. He’s been poor and uber rich, he’s been a character who never swayed from his morals to one that made a deal with the devil, (yes I know it was made to be MJ who asked Peter to take the dead with Mephisto but it was still Peter who went there and did it). So in all that has been in the life of Spider-Man/Peter Parker, what will be the roots they use? The name Nick Spencer might ring a bell for you and it should because he’s the writer that created a controversy himself with another Marvel character. Though Dan Slott might have killed off Peter Parker and made Doc Ock Spider-Man, Nick Spencer kept Steve Rogers alive and made him the leader of Hydra. This was a huge deal where people who didn’t even read comics were upset over what he did. I’ve read a lot of books over the years where they caused controversy, but I think this was one of the biggest ones I’ve read. Nick Spencer took the Captain America, the man who is all about fighting the Nazis and Hydra, is all about the way America is run with democracy and freedom, and then made him what he hated. Captain America became Hydra, in essence he was a Nazi, in fact the leader of them. Captain America imprisoned heroes, killed some of them, and turned America and almost the whole world into a dictatorship of hate and death. He also then said it was the real Steve Rogers doing this, not a clone or mind controlled or brainwashed Steve Rogers, but then in the end it really didn’t turn out to be that way. Now there are 2 Steve Rogers, the “original” (which I don’t consider him to be, I will talk about that in another blog), and now the evil Hydra Steve Rogers. This was already announced but on April 18, 2018, 2 weeks from now, Bendis will contribute to Action Comics #1000. This will be his first story and after that he will do a 6-issue miniseries called Man of Steel in May. I’m upset by this move as well as thinking it might be a good thing for the Superman books. 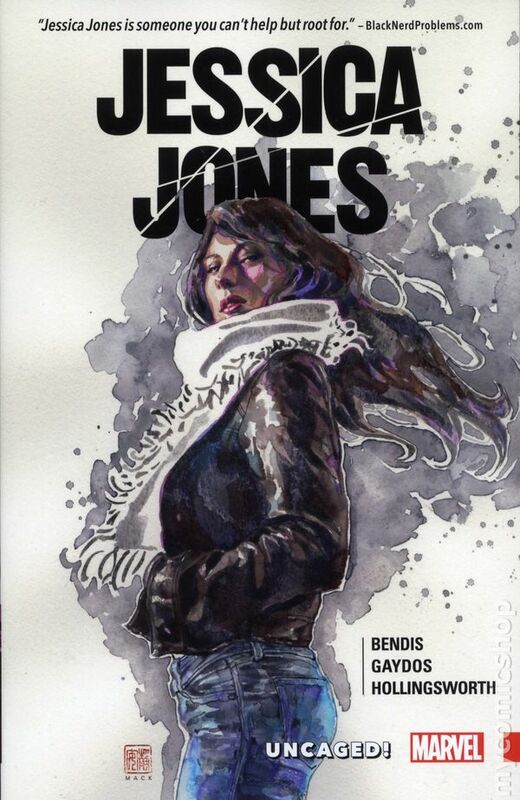 The reason I’m upset is that Bendis along with Michael Gaydos, the creators and original team of Jessica Jones and the book Alias she appeared in, have been working on the title Jessica Jones. Since her appearance back in 2001 I’ve loved this character. I was reading Alias as it was first released, and yes I still have my issues of it, then she went to the title, “The Pulse”, and after that Jessica Jones made appearances in different titles. She’s a character I can’t get enough of and I was really happy when Marvel released a new solo title with the original team on it called, Jessica Jones. It’s been a great title and with issue #1, it was a must read on the day each issue is released. Well, now with the move to DC, Bendis no longer will be working on the book and sadly Jessica Jones was canceled and the last issue #18 just came out. When will we get her back again in her own title? I hope soon. January marks the start of a new year but in 2018 DC Comics started some of their new books that feature brand new characters. I can’t say I know anything about them other than some of the articles I read on sites because I don’t read DC titles but from what I hear, they are decent books. I know that with one, The Silencer, the art is being done by John Romita Jr., that alone makes me want to buy the book. From what I have been reading, some of these characters will have ties to the series, “Dark Knights Metal”. 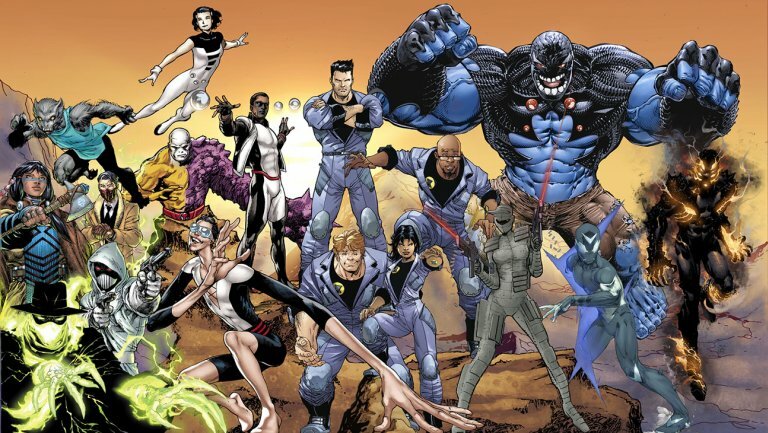 The titles of these books are, Damage, The Immortal Men, The Terrifics, and The Silencer. 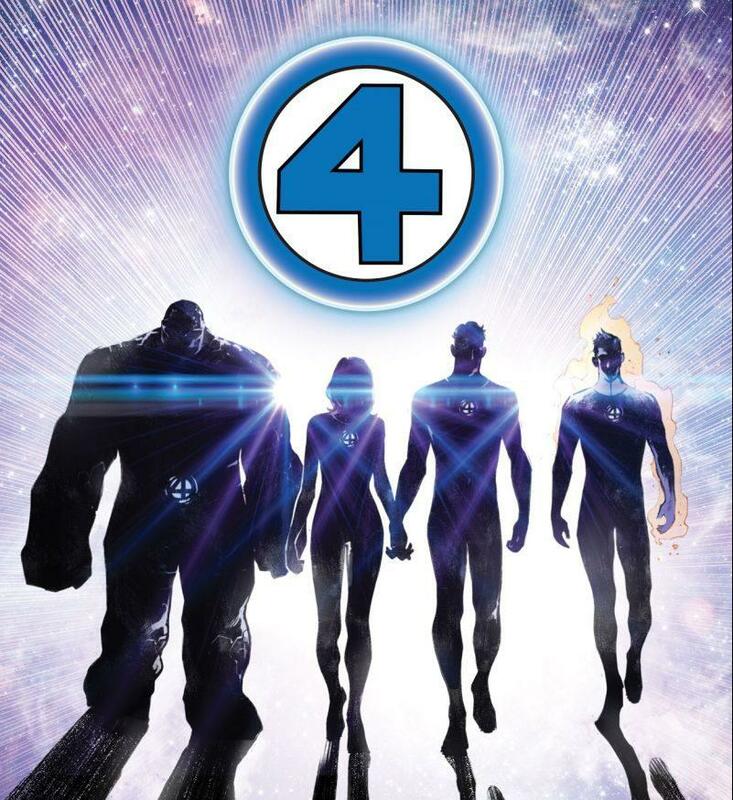 That’s right, the Fantastic Four are returning to the Marvel Comics line up. Not only that but Dan Slott will be writing the book with Sara Pichelli doing the art. Not much is known about what the book will cover or how it will tackle the issue of the fact that Reed and Sue have been missing for years now but the news was just released and the book won’t come out until August so we have time to learn more. No I didn’t get mixed up with who I was talking about, the Joker is reformed and trying to do good while Batman seems to have come unhinged. 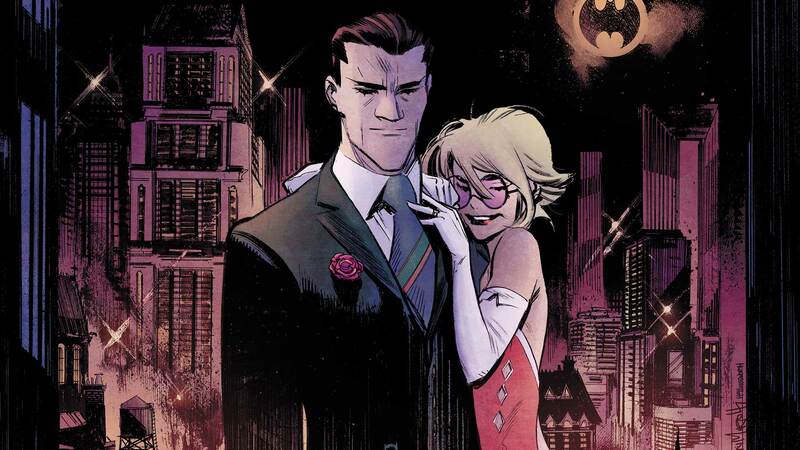 What I’m talking about is the story going on in the title, “Batman: White Knight”. It’s almost at the end of the run but it’s been a good book so far. Not only is Batman looking more like the Joker and the Joker more like Batman, but there are 2 Harley Quinns. When the New 52 begun, Superman no longer had those iconic red trunks on his suit. Well, that’s going to change as DC has announced that they will be bringing the trunks back. But the reason I bring this up is because on April Fool’s Day, DC made an announcement that all the heroes would have trunks on and even posted an image of them all. 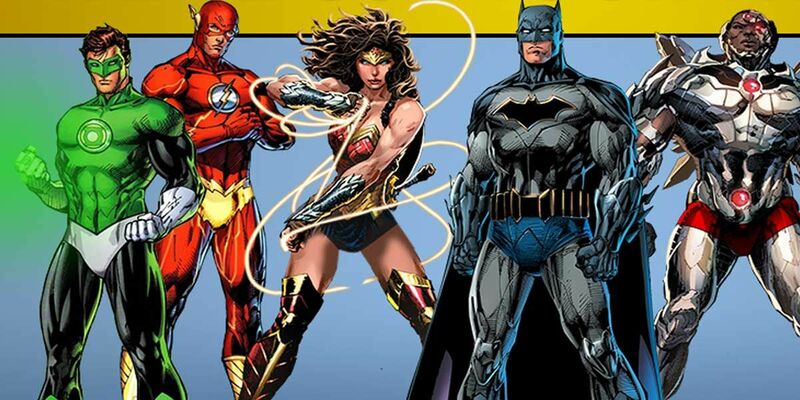 Aside from Batman, who has worn trunks and Wonder Woman who if you took the trunks away would be showing a lot more than her legs, the others looked odd and funny in the trunks. I’m glad it was a joke and it was a good one. Amanda Conner and Jimmy Palmiotti have been writing and drawing the Harley Quinn titles for a good number of years now but they are going to be leaving the clown princess of crime behind. The new team will be Sam Humphries writing and John Timms drawing the Harley Quinn title starting with issue #45 out in July. These two will start their run with having Harley questioning herself about if she wants to be a hero or a villain. I hope they do a good job with this book because I love Harley Quinn and want some great things to come for this character. And to end this off, the most annoying and the thing I am so fed up with happening in 2018 for comic books, the renumbering once again by Marvel. Titles will be going back to issue #1 after just a few months of getting switched back to their original numbering. What was this? Well, I think it was just a ploy being done by Marvel to get more money and charge more for the titles. Keep the numbers the same, unchanged, that means the cover price has to remain the same unless there is some special reason to raise the price. Change the number to orignal numbering then they can have that issue go up in price because it's a "special" issue, and they can do mulptile variant covers and reprints of it where they force retailers to buy mulptile copies to get one copy of a variant. Which in turn makes the retailers charge a lot to the buyer. Then since these original numbering issues are reaching milestone numbers, like 800 for Amazing Spider-Man and 600 for Daredevil, and others are similar, they can charge $5, $6, or even $10 for that issue and do even more variant covers. Then they end it and start with a new #1 and boom, we are getting another issue at $5 to $10 for a regular cover and all the different variants. I'm so tired of this that it's pushing me away from buying new titles. I'm not wanting to go back to the days of the stand alone stories and where they didn't have good on-going plots, but I do want to go back to the time when I was able to read 1 title and know what was happening instead of needing to get 5 years of multple titles to try to understand one thing. Just try to go pick up a Marvel title in the last 15 years where it's not some part of a story that has a miniseries surrounding it or it is going into other books or they just start the book over again where it keeps some stuff and ignores other stuff. If this keeps up there will be a day that I say no more to the new books and I start spending my money on back issues. Why spend $5-$100 getting a regular cover current issue or a variant cover of it when I can buy a 8.0+ graded copy of the first appearance of Cloak & Dagger for that same amount? It will become out with the new and in with the old if Marvel keeps this renumbering scheme going.